Traveling light always is liberating. One bag and only the gear you’re really going to use is the way to go. Lighter luggage and less stuff equals less worries. Using public transportation is easier and walking is not pain in the back (quite literally) anymore. One thing that matters, though, is the quality of your gear. To make the process of finding the right gear easier in this article I’m giving our recommendations, that include some of the best ultralight backpacking gear. It’s a quality backpacking gear, that’s super light and is going to last you. It’s also gear that’s suitable both for backpacking and hiking trips. Are you planning to go and camp in the wilderness? Thanks to ultralight travel gear nowadays it’s possible to go on these kind of trips light as well. Scroll down to learn more about how to make a backpacking journey more pleasant (lighter bag = better), and hassle free. Note that you may not need all of that that I’ve listed below – and that’s fine – most will not need all of that. And you should also not look at it as a complete packing list. Because it isn’t a complete backpacking packing list. What to pack for a backpacking trip? What to pack for a hiking trip? How to travel as light as possible? These are some of the questions I’m going to help you to find the answers to in this best lightweight backpacking gear guide. Remember, quality ultralight backpacking gear is not cheap! So, if you want to travel light and have good travel gear, save some money and start preparing for your trip early enough! One more thing to remember – the lightest stuff is not always the best. So do your research, know where are you going to and choose your gear wisely! Scroll down for our ultralight backpacking gear list + our recommendations. Not only it is important to choose lightweight clothes and gear, but also a backpack! Choose an ultralight backpack to reduce total weight even more. Remember, the lightest backpack is not always the best lightweight backpack, so do a research before buying! 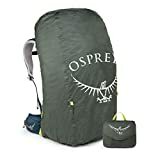 Comfortable and supportive extra lightweight backpacking pack. Despite being so lightweight it’s durable and will hold up to wear and tear. The exterior of the Osprey Levity pack is made of NanoFly material which is very durable and abrasion resistant. Ultralight AirSpeed suspended mesh back panel which is fully ventilated will keep you cool and comfortable. The backpack features well padded ExoForm hipbelt and harness which balance out the weight of the bag perfectly. The Levity pack features two fabric side pockets with InsideOut compression cord. There are also removable side compression cords and a front fabric pocket, as well as internal hydration sleeve. 60 liter: 1.9 lbs (870 g). Women’s specific version of the Levity – Lumina – is available. Check it out on Amazon! To protect your pack and gear in it from rain you’ll have to get yourself a lightweight rain cover. Actually, you can get any rain cover because majority of them are lightweight enough. However, if you count every ounce, we recommend you to get the Osprey UltraLight rain cover. To be able to protect your backpack and your belongings in it from rain better get yourself a good lightweight rain cover! The Osprey UltraLight rain cover is a great option for those who count every ounce. It is made of lightweight 40D Rip-stop Nylon which is durable and extremely water resistant. The rain cover folds down into its own pouch. Note, that the Osprey UltraLight rain cover is not the most durable rain cover when it comes to rough transportation conditions. Size: M, L, XL (30 – 110 liter). Weight: 2.8 oz (80 g) – 3.5 oz (100 g), depends on size. To save space in your bag and make it lighter as possible choose a lightweight tent. It should be good quality and extremely water resistant in case you get caught in a downpour. Made of durable ultralight materials, The Nemo Hornet is one the lightest tents on the market. The tent features a privacy panel for extended coverage and security, and DAC Featherlite hubbed tent poles which reduce weight and allow you setup the tent quickly. The one-piece tub floor will protect you from the elements and increase the longevity of the tent. This ultra lightweight tent has a vestibule where you can keep your gear. The Nemo Hornet is available in 1 person and 2 person sizes. The 2 person tent features dual doors. Nemo’s 2 person tent is quite tight, thus it’s the best backpacking tent for couples and solo travelers. If you are two friends who plan to travel and camp together, check out other options (e.g., Big Agnes Copper Spur HV UL). 2 person: 2 lbs 5 oz (1.05 kg). Just like with everything else try to choose the lightest possible. However, it might not work for everyone. Some of us are cold sleepers, and the most lightweight sleeping bags are summer sleeping bags. But, cold sleepers, don’t worry! There are plenty of good and warm sleeping bags that aren’t that much heavier than most of the best lightweight summer sleeping bags. An ultralight sleeping bag perfect for minimalist travelers that count every ounce! The Western Mountaineering Summerlite 32 is a 3 season sleeping bag but some people might get too cold in this sleeping bag during late autumn or early spring. So, if you are a cold sleeper, get yourself a warmer sleeping bag. There are plenty of warm yet quite lightweight sleeping bags (eg., Western Mountaineering 10 Degree Versalite). The Summerlite is a traditional mummy sleeping bag, but it has an insulated draft tube and a warm hood with a drawcord. The sleeping bag has a double full length zipper that can be opened down at the footbox if it’s too warm. This compact sleeping bag comes in a stuff sack. Weight: 1 lb 5 oz (595 g). Sleeping pad – for extra warmth and comfort. Quality, ultralight insulated sleeping pad is the best option for hikers that want to travel as light as possible. Big Agnes Insulated AXL Air – ultralight and compact inflatable 3 season pad. The shell of this pad is made of high-tenacity, rip-stop nylon material. The sleeping pad features PrimaLoft Silver insulation which traps body heat. Thus you’ll stay warm even when the temperatures will start to drop. Antimicrobial treatment inside the pad prevents microorganism growth. The sleeping pad has a low-profile, single port, two-way valve which allows you to inflate the pad easily and deflate it fast. It comes with a repair kit. The Big Agnes sleeping pad is available in both mummy and rectangular shape, and comes in several sizes. Weight: 10.6 oz (301 g) – 15.9 oz (451 g), depends on the size. Lightweight inflatable camping pillow is the best option for ultralight hikers. It folds down to a small bundle and doesn’t take up much space. Made from 20D laminated polyester, the Sea To Summit Aeros Ultralight is very light and compact. It folds down to a small bundle and doesn’t take up much space. The camping pillow is laminated with abrasion resistant high strength TPU, and has durable RF-welded construction. Thanks to the curved internal baffles your head will rest comfortably on the pillow. Thanks to the scalloped bottom edge that centers it over the shoulders, you can use this pillow when you are sleeping on your back, side or sitting upright in a chair. It takes only a few breaths to inflate the Sea To Summit Aeros pillow. Weight: 4 oz (113 g). Hammock can be used both for lounging and camping (sleeping). If you are traveling to a tropic destination and plan to camp there, a hammock, a lightweight tarp shelter and a summer sleeping bag are all what you need for sleeping. The Ultralight Single+ is an extremely lightweight and packable backpacking hammock. 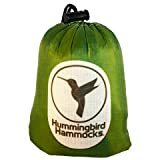 It folds down to a small bundle, a size of a small toiletry bag (6″ x 4″ x 2″ / 15 x 10 x 5 cm), and weights way less than other backpacking hammocks on the market. The hammock features Button Link attachment system which is lightweight and doesn’t contain heavy metal parts. The Ultralight Single+ hammock is made of nylon and is very durable – it can hold up to 350 lbs (158 kg). It is designed by an FAA Certified Parachute Rigger. Weight: 7.6 oz (216 g). It’s very important to stay hydrated all the time! So, when preparing for your upcoming trip, don’t forget about a reusable water bottle! Choose a quality, lightweight bottle to reduce the total weight of your bag. Despite the flimsy look, collapsible travel bottles actually are very good and durable. Just get one from a reputable brand, such as Platypus. Platypus SoftBottle – a super-flexible travel bottle. It’s very lightweight and durable, and has simple yet smart design. Bottle narrows at the middle for ease of holding. It’s very compact and highly packable thus it doesn’t take up much space when folded. Platypus SoftBottles are BPA-free, BPS-free, and phthalate-free. The Platypus SoftBottle comes in 0.5 and liter-size (16.9 and 33.8 fl oz) with either a Closure Cap or a Push-Pull Cap. Weight: 2 oz (57 g). Bath towels are not really designed for travel, especially a hiking / camping trip! They are large, fluffy and take up much space in the bag. A microfiber towel is a great alternative. It’s lightweight, folds up really small and dries quickly. Way more compact and way lighter than a regular bath towel. 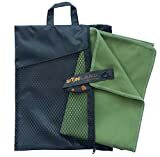 The Sunland microfiber towel folds down to a small bundle and doesn’t take up much luggage space. It dries quickly and is versatile. It can be used as a bath, beach, camping or even as a dish towel. The Sunland towel is soft and gentle to the skin, and is super-absorbent. The towel is available in several sizes and comes with a carry bag. Weight: 3 – 10.2 oz (85 – 288 g), depends on the size. If you are going on a self supported trip making your own food is the only option. Get yourself a portable camping stove and lightweight cookware set to save space in your bag and reduce total weight of the bag. A compact and collapsible camping stove made of materials which can stand high temperature – aluminum alloy and stainless steel. Etekcity Ultralight camping stove is portable – it folds smaller and doesn’t take up much space in a bag. The stove comes in a carry case (dimensions – around 3″ x 2″ x 1.25″ / 7.6 x 5 x 3.2 cm). 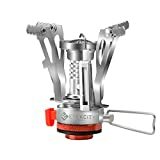 The camping stove features 4 stainless steel arms for balance and support, as well as push button igniter and fuel flow valve. It is compatible with any EN 417 Butane / Propane gas cartridge. However, you don’t have to buy a camping stove! You can make your own functional ultralight backpacking stove from a beverage can! Plan to cook during your backpacking / hiking trip? 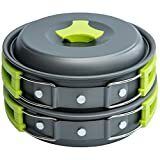 The MalloMe is a great lightweight and inexpensive camping cookware set that consists of: an Aluminum, non-stick pot, a pot cover, a non-stick pan, 2 BPA-free bowls, a folding stainless steel sport, a BPA-free soup spoon, a wooden spatula, and a sponge. The set comes in a nylon drawstring pouch. Weight: 14 oz (400 g). Heading off-the-grid with your gadgets? 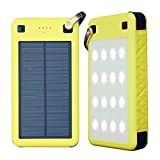 Don’t forget to take with you a good solar power bank! It will come in handy if you are heading out on a longer adventure. In case of necessity (unlike with a regular power bank) you will be able to recharge this one also from the sunlight. The ZEROLEMON powerbank is a high-capacity (26 800 mAh) solar power bank with 2 USB ports and a Type-C port. It is compatible with wide range of devices, including iPhone, iPad, Samsung Galaxy S8, S8 Plus, Google Pixel, MacBook 2015/2016, Nintendo Switch and many more. This solar power bank features a LED flashlight and a hook. You can easily attach it to your backpack without worrying that it might get wet or damaged – the ZEROLEMON powerbank is water resistant, and shockproof! Charging from sunlight is not the only way how to charge this powerbank. You can charge it via USB as well! Weight: 19.90 oz (565 g). Also a headlamp will come in handy when traveling to developing countries – it will help you move around without bumping into things during a power cut. An ultracompact and lightweight 50 Lumen headlamp. 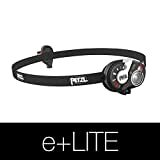 The PETZL e+LITE headlamp features a locking on/off switch, so you can’t accidentally switch off the headlamp. Also it has an adjustable headband and a safety whistle. The e+LITE headlamp is extremely durable – it resists extreme temperatures and can be submerged under 3 feet of water for up to 30 minutes. Weight: around 1 oz (30 g). Headwear. Lightweight Buff (bandana) is a perfect headwear for camping trips. It’s versatile and multifunctional – it can be worn in up to 13 different ways! Hiking pants. Choose lightweight, moisture-wicking and quick-drying pants! Long sleeve base layer. Can be used as a base layer in cold weather or during the night – as sleeping bottoms. Base layer bottoms. Can be used as a base layer in cold weather or during the night – as sleeping bottoms. Camp shoes or sandals. Get yourself an extra pair of footwear to change into after a tiring day of hiking. Merino wool socks. 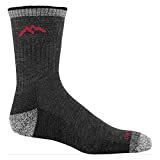 Lightweight and soft socks that will keep your feet warm. Down jacket. Down jacket can be used both as a middle layer and a jacket. Rain jacket. To protect the middle layer from the rain and feel comfortable in windy conditions. 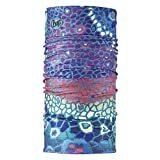 The Buff bandana is versatile and multifunctional – it can be worn in up to 13 different ways! Check out the video below to find out how to wear it! Merino wool Buff and fleece Buff are also available. These are warmer and softer than the original one. Weight: 1.4 oz (40 g). Columbia Silver Ridge pants are inexpensive and lightweight convertible pants. They are made of breathable and quick-drying fabric. You won’t be lacking in storage space, as these pants have several pockets: 2 deep side cargo pockets, 2 front pockets, and 2 back pockets. Women’s Columbia Silver Ridge pants are also available. Check them out on Amazon! Weight: around 12 oz (340 g). The Helly Hansen Lifa Stripe Crew – an original Helly Hansen base layer with the classic stripe along the sleeve. It is an inexpensive long sleeve base layer that will keep you warm and dry. It is made of lightweight and breathable fabric that is pleasant to the touch. This insulating, regular-fit base layer is perfect for hiking, climbing and skiing, as well as for everyday use. Women’s Helly Hansen Lifa Stripe Crew base layer is also available. Check it out on Amazon! We suggest you to take an extra long sleeve base layer, so you can change, or wear the other one during the night – as a sleeping top. Take with you base layer bottoms if you are going on a trip someplace cold! Also you can wear them during the night – as sleeping bottoms. Being lightweight and soft, the Under Armour Base bottoms are among the best on the market! The bottoms are made of 92% Polyester and 8% Elastane blend which is moisture wicking and dries fast. Anti-odor technology prevents the growth of bacteria which is the source of bad odor. Women’s Under Armour Men’s Base bottoms are also avalable. Check them out on Amazon! Xero Shoes Z-Trek minimalist sandals are versatile. Being so lightweight and compact, not only they are perfect camp shoes but also great sport and hiking sandals. 5.5ml FeelTrue outsole protects your feet from rough surfaces while maintaining that barefoot feel, and adjustable Z-Pattern straps will hold your feet tightly. Good news for vegans – the Xero Z-Trek sandals are made from 100% vegan-friendly materials! Women’s Z-Trek sandals are also available! Check them out on Amazon! Weight: around 13 oz (370 g), depends on the size. Darn Tough Vermont merino wools socks are lightweight, soft and warm. They are ideal for hiking and everyday use in cold weather. The Darn Tough Vermont socks are made of fine gauge Merino wool which is naturally antimicrobial and antibacterial. Cushioning along the bottom of the foot provides support, and seamless construction prevents bunching and blisters. Women’s Darn Tough Vermont Merino wool socks are also available. Check them out on Amazon! Weight: 1.6 oz (45 g). Lightweight yet very warm hooded down jacket with close-to-body fit. 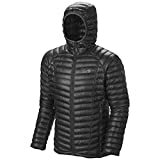 The Mountain Hardwear Ghost Whisperer jacket is made of Whisperer 7D x 10D Ripstop (100% Nylon), and insulated with Nikwax Hydrophobic Down. The 800-fill withstands moisture and retains its maximum fluffiness and warmth even when wet. The jacket has low profile quilt pattern and elastic cuffs that helps trap warm air. The Mountain Hardwear Ghost Whisperer jacket can be folded into its own pocket for easy storage, and features a built-in loop for carabiner attachment. Women’s Mountain Hardwear Ghost Whisperer is also available. Check it out on Amazon! Weight: around 8 oz (227 g). A lightweight rain jacket which is great for hiking and daily use. The Marmot PreCip is made of Marmot® NanoPro™ breathable, rip-stop waterproof fabric, and feature weatherproof taped seams. The jacket has an adjustable hood that can be rolled into collar, and adjustable Velcro cuffs. As the PreCip jacket has a pack-pocket, it can be packed into itself. It also features a built-in loop for carabiner attachment. Women’s Marmot PreCip is also available. Check it out on Amazon! Weight: 11 oz (312 g). It’s the total weight of all the items I have mentioned and reviewed. Total weight: 13.6 lbs (6.16 kg). Lightest item on the ultralight backpacking gear list: socks, Buff, headlamp. Heaviest item on the ultralight backpacking gear list: tent, backpack, sleeping bag. Note, that this is not a complete packing list, thus it doesn’t contain all the items you have to take with you on a backpacking / camping trip. Also some of the items aren’t necessary if you are going on a trip to a warm country. Like, down jacket, warm base layer and merino wool socks. In this case you should get yourself appropriate gear. Backpackers that don’t plan to go camping in wilderness also will find that some of the things listed in this article are not necessary for them to bring. If you are hiking and camping you should bring with you some snacks and food, as well as a camping gas canister. To be able to “use the bathroom” while camping take with you some toilet paper or tissues, a small shovel (optional; but you must bury your “outcome” anyway), and a bunch of small plastic bags for used toilet paper. Anything you would? 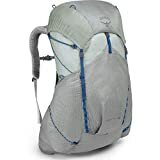 Some really great ultralight backpacking gear you’ve been using?